“Welcome, please come in,” says a smiling man in his 60’s who sticks his out out of the window. The place was where the wonderful smells of a “history”. There were few lights, a little dark, and a cool air touched skin. There were a lot of tools and bottle of alcohol, around. The name of this place, Nishioka-Syuzo, and a Japanese sake is made in here. In middle of July, the weather was cloudy and sometimes rained, quietly. Tosakure-station in Kochi, people almost have not walked around the station. It takes 10 minutes by walk from the station, small stores as supermarket, fish shop, clothes shop, dagashi-store etc, stood in a row. 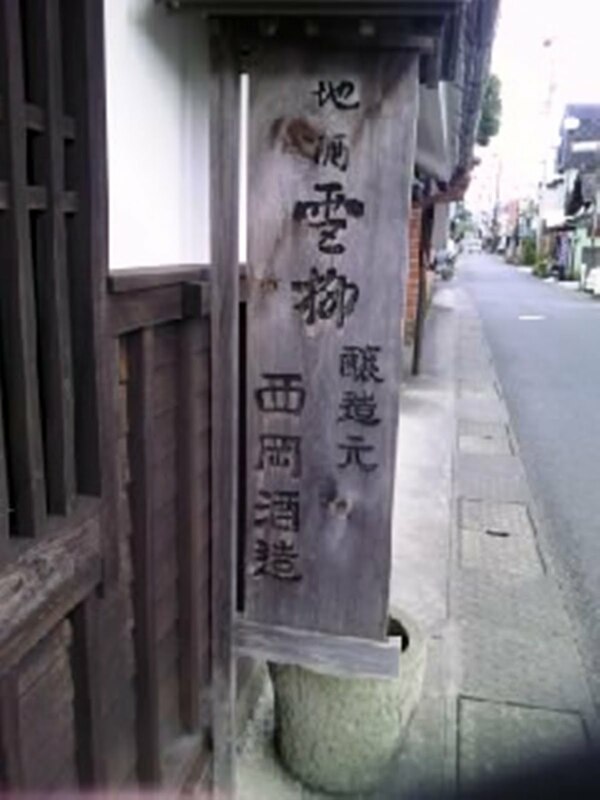 And on the way of the small shopping arcade, there was a small Japanese traditional structure and old signboard drawn “Nishioka-Syuzo”. From the entrance of the structure, a straight way runs about 80 meters. On the way,at the left hand, there was a working space. And keep on straight, there are a lot of machines that to make alcohol. And then pass through the machines, end of the way, a grave place is there. 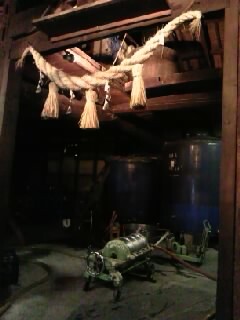 Many old poles surround the some sake cask which have 2 meters or nearly 3 meters tall, and a big sacred straw rope and a household Shinto altar are decorated in front of the two poles.The sake casks has been using for more than 230 years. “Uh, maybe no. It gets bad if we do not use it.” A man wearing a blue work clothes, Nobuhiko Hayashi, 30 years old, said giving a wry smile. The history of Nishioka-Syuzo has begun from 1781, a middle of Edo-period. The founder is Izutsuya Jinnosuke, and the firm have been continuing to ninth. However, the history is too old to know about at that time. But Hayashi told about the story of the eighth person who now boss’ father. It was the time of World War Ⅱ, the eighth person , Nishioka Kihachiro fought as a Japanese soldier. And when he was in the war, he lost his an arm. Then, he came back to his firm, and kept making Japanese-sake. He was surprising man.Because although he did not have his arm, he deftly did the work that it can not do easily even the worker who has two arms. The building and the casks did not be damaged despite they were in a wartime. And now, the basic making method of Nishioka-Syuzo have not ever changed since when the firm opened. The underflow water is the groundwater penetrated into riverbed. The underflow water is clearer and its quality is better than the normal water. It is used for Japanese sake,and the taste become softer and more delicious. And the rice which the most important material in production is made in Kochi. The Japanese-sake made by Nishioka-Syuzo attracts not the people in Kochi, but the sightseers. By the way, the Japanese sake is made from rice, koji (malted rice) and water. This process of production takes about 40 or 50 days, and the works are done by only 6 workers. So they can not make products so many like a large company, so Nishioka-Syuzo holds less than 10% in the market share in Kochi prefecture. The process is hard and takes a long term, but workers make their product thinking about people who drink it. However, Nishioka-Syuzo’s Japanese sake makes people happy. In Nishioka-syuzo, there is the corner of Japanese sake tasting. “Junpei” one of the products has refined taste. The moment when you drink it, a sweetness of rice spread in your mouth softly, and the next sharp and dry taste come and stimulated your tongue. It was light and also deep. On the other hand, “Ginjo-Ippontsuri” puts next to Junpei is very dry and the taste disappears soon. It can images that a fisherman doing the single-hook fishing for bonito in a wild waves. 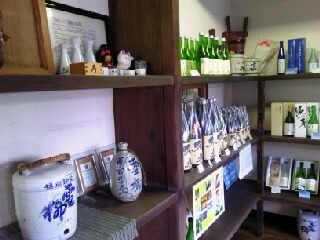 If you come to Kochi, you will have opportunity to drink Japanese sake. And when you drink it, you will know how delicious the Japanese sake in Kochi is. People buy it at a supermarket, and they just enjoy the taste. However, when they would know about the history and worker’s zeal for products, it will become more “tasty”. Nishioka-Syuzo has made their history with wonderful natures. It will not stop and will continue looking for great taste. At last, Hayashi talked modestly about the future of his firm, but the confidence for the Japanese sake they make was in his eyes. Oh, I really wanna drink Sake, and eat Katsuo-tataki!! I can’t drink much sake as you but if I have a chance to drink I want to try.